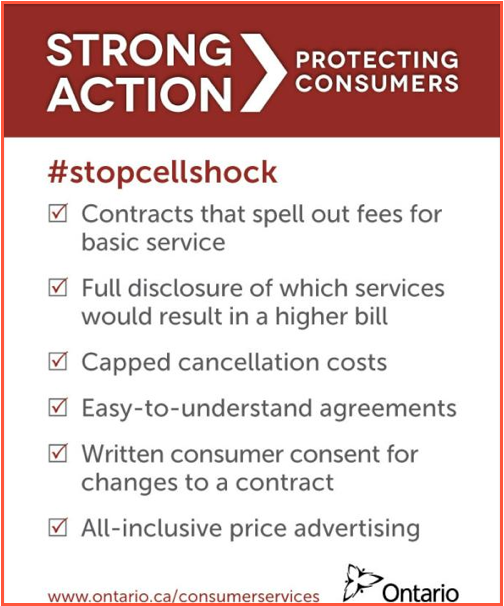 The Ontario government has just announced plans to introduce legislation aimed at curbing “cell phone shock” for consumers. With consumer complaints about wireless services skyrocketing, the McGuinty government’s decision to step into the fray and shake things up should be welcomed by Ontarians fed up with crummy service and unfair (even legally dubious) contracts. Ontario is poised to join provinces like Manitoba and Quebec where similar legislation is already in place. At the federal level, the CRTC is dipping its toes in the water as well, with a call for comments on whether it should reconsider its hands-off approach to retail wireless and establish a consumer code of conduct for the national wireless industry. Note: The CRTC is going to federalize regulation. Where does that leave provincial regulation? Unfortunately, the provincial track record shows a great big goose egg when it comes to standing up to the federal government on communications issues. So while we should applaud Ontario for demonstrating that it’s in touch with its citizens, once the CRTC releases its own rules, McGuinty’s will be rendered moot. Disputes between federal and provincial governments don’t always proceed cordially. In the late 60’s and early 70’s, the Quebec and federal governments locked horns over the burgeoning cable TV industry in a retrospectively entertaining battle for jurisdictional supremacy. Emphasizing a ‘national dimension’ to Canadian telecommunications, the Department of Communications, headed by Gérard Pelletier, granted a federal license to entrepreneur François Dionne allowing him to establish a cable company in eastern Quebec. At the same time, in the interest of promoting independent provincial industry, the Quebec Public Services Board issued a contradictory license to local businessman Raymond d’Auteil. Perhaps as a test of federal authority, provincial courts vindicated d’Auteil’s claim to the territory, and in 1975 he beat Dionne in a race to open for business first. A bitter (and in retrospect highly comical) contest ensued between federal and provincial authorities over the legality of the local cable operation. Federal police were promptly dispatched to confiscate d’Auteil’s equipment. Not to be outdone, the defiant provincial government bankrolled replacement equipment and soon the renegade cable provider was back up and running. The RCMP doubled back, but d’Auteil was tipped off to their return. By the time the Mounties rolled back into town he had already dismantled his new equipment and hidden it in a nearby swamp. Once they left, he reassembled his antenna in a safe location under the protection of Quebec’s provincial police force, who were instructed to protect it from further ‘federal vandalism’. Frustrated by the ongoing shenanigans, the federal government obtained a favourable outcome when in 1978 the Supreme Court of Canada placed cable squarely in their jurisdiction, where it remains to this day. Since all cell phone providers are ‘interprovincially connected’, it would seem that federal legislation is trump. Although provincial governments have enacted consumer protection measures in the interim, once the CRTC institutes its own conflicting rules, you can bet provincial measures will be tossed out the window faster than you can cancel your contract. Today, with more and more Canadians using smartphones for things like Youtube and Netflix, the line between cable and phone services is looking pretty blurry. The conceptual divide is likely to erode even further in the future as companies like Bell already offer their broadcasting content as add-ons to cell service. No matter whether we’re talking about broadcasting or telecommunications, the moral of the story is the same: when provinces wrestle with Ottawa for control, the latter comes out on top. This is a problem because while provinces have a history of acting for the benefit of consumers, the CRTC is more inclined to side with the interests of big telco’s. That means that more progressive rules like the ones McGuinty is proposing or the ones already in effect in Manitoba and Quebec will wind up being watered down in the hands of the CRTC. After all, it’s Telus and Rogers that are currently goading the CRTC into reconsidering its wireless policy. They don’t like having to comply with pugnacious provincial legislatures, and by getting the federal government to assume responsibility, they stand to have substantially more sway over the overall outcome. You still have a chance to have your say with the CRTC, by submitting a letter or signing Openmedia’s petition. But don’t hold your breath for any revolutionary changes to come out of Ottawa’s consultation. As Dwayne Winseck suggests, if we want really progressive solutions, we need to consider innovative models like open spectrum. We might look to Australia, where the broadband backbone that supports digital communications is currently undergoing outright nationalization, leveling the playing field for smaller competitors. While we’re busy having jurisdictional squabbles over contract terms, the rest of the world is leaving us in the digital dust.